These Thanksgiving Party Games are mostly designed with family and small children involved. I like to assign an older sibling, cousin or a favorite Aunt to run these games while the dinner is being prepared. It keeps the kids out of the kitchen and out from under your nose. It helps them have a great time with family and extended guests. Some are quiet indoor games while others involve pumpkins and running around outside. Depending on your location and the weather, you will find something for every gathering. Take a peek at the variety and see which ones will suit your needs. There were no Thanksgiving party games like we have today back in 1621, when the Wampanoag people and the Pilgrims sat down together to give thanks for nature’s bounty. Although the celebrants at this particular meal didn’t even call it “Thanksgiving”, this particular harvest feast is the one after which we model our modern-day Thanksgiving celebrations. People of both cultures had been giving thanks for the fall harvest and other gifts of nature for many centuries. It is interesting to note that the religious element, giving thanks to God, was not present at this particular celebration in 1621, even though the Pilgrims were devoutly religious. 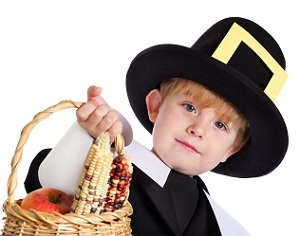 In fact, some early Pilgrim "thanksgiving days" were actually fasts rather than feasts. Imagine that! However, the Native Americans had their own religious customs and beliefs. As a result, during this "first" Thanksgiving, Pilgrims and Native Americans did not focus on what was different between them, but instead concentrated on what they all shared. The two groups of people worked side by side to hunt and prepare food as equals and friends. Their friendship and cooperation was yet another thing for which to be thankful. Other feasts such as this one took place throughout the New World, where settlers and Native Americans worked together and celebrated together as one. When we sit down to our Thanksgiving dinner, we honor a piece of early American history. The story of the Pilgrims and Native Americans serve as a good reminder for all of us to be thankful for what we have--no matter how much or how little. After 1621, future Thanksgiving celebrations occurred at various times throughout the year. George Washington declared a feast of Thanksgiving in 1789, and presidents issued similar yearly proclamations after that. During the Civil War, poet Sarah Hale started a campaign to celebrate the holiday on the same day throughout the country. President Abraham Lincoln saw it as a way to unite the country, and he in 1863 he proclaimed a national Thanksgiving celebration on the last Thursday in November. It was changed from the last Thursday to the third Thursday by Franklin Roosevelt in 1939 as a way to lengthen the Christmas shopping holiday. In 1941, Roosevelt finally changed the date to the fourth Thursday in November, proclaiming it a Federal holiday in 1941. Kaboose also offers recipes, crafts and kids printables to add to your Thanksgiving party games.